Some of my fondest memories from our time in DC involve my dear friend Kelly. If I had a nickel for every time she and I went to Starbucks together, neither one of us would have to work anymore. When we met, Kelly and I were 20-somethings working our fingers to the bone to establish ourselves professionally. During one lunchtime excursion, as a wedge of lemon sat on one of our plates, we discussed the challenges of working for a newly-merged nonprofit where the processes, procedures, lines of communication, and chains of command were still in development. We decided that it was sort of like being told to take care of a lemon, making that lemon into lemonade, then being told by a different supervisor that we should have made lemon pie, while another person wanted us to make lemon cookies. While this story is likely not funny to anyone but Kelly and me, we continue to reference it to this day. Kelly has worked overseas for the past few years, and I’ve certainly missed her. 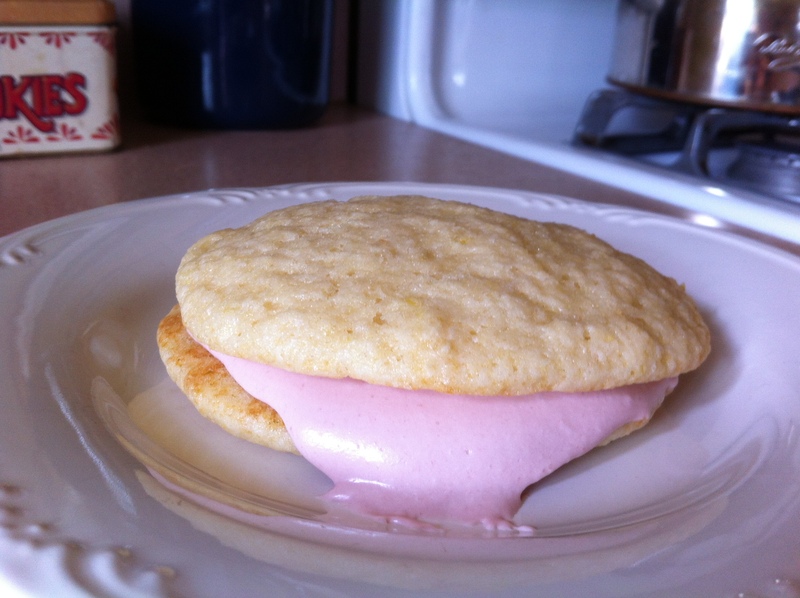 Yesterday, during her visit to Pittsburgh, she and I made these lemon raspberry whoopie pies, which are admittedly more like lemon raspberry sandwich cookies. Either way, they involve lemons…in the best of senses. In a mixing bowl, cream together butter, sugar, and lemon zest until very light and fluffy. Add egg, lemon juice, and vanilla and beat for 1 minute. Add half the flour mix, then buttermilk, then remaining flour mix, beating until just combined after each addition. Using a two-inch cookie scoop, drop scoops of dough at least 2 inches apart on the cookie sheets – they will spread when baking. Bake for 11-13 minutes, until cookies are set. Allow to cool completely before filling and assembling. Combine butter, marshmallow fluff, jam, vanilla extract, raspberry extract, and 1 cup powdered sugar in a mixing bowl and beat well. Add another 1/3 cup powdered sugar if your mixture is too thin; you want an easily-spreadable consistency but not one that is too runny. To assemble cookies: using a one-inch cookie scoop, scoop filling onto one half of each cookie and spread with a knife, leaving about 1/4 inch around the edges. Top with another cookie; filling will spread slightly. Store in the refrigerator.